Welcome If you’re looking for a Sefer, you are in the right place. We are a sourcing service. 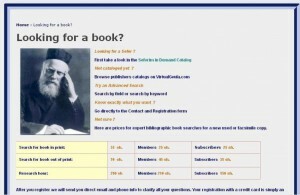 At Virtualgeula.com we’ve consistently been able find books that Seforim stores claim are unavailable. Using our service, you can acquire any Sefer that has ever been printed, as a new, used, or facsimile copy. Why is this important? It would seem that digital media are winning the publishing war. Many important Seforim are no longer considered worth printing because they have been scanned. However reading on screen one misses the nuances, the richness and the depth one gets from a quality printed book. In fact a printed Sefer is the most effective way for a Jewish person to study Torah. Our Rabbis call this ­ אותיות מחכימות Letters enlighten. Who are we? We began in 1986 as the Judaica Archival Project, a preservation and access project at the Hebrew University Library. 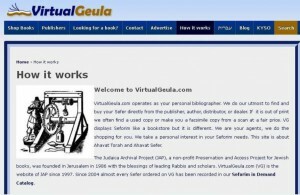 We came online as Virtualgeula.com in 1997. Over the past 30 years we have helped thousands of individuals acquire new, old and rare Seforim. We also help Torani authors reach thousands of new readers. Please come in and explore a whole world of Jewish learning. 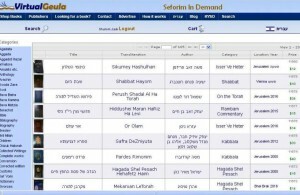 Read About VirtualGeula.com in Mishpacha Magazine!